Home Opinions So where was Rahul Gandhi through the entire post Karnataka election result drama? So where was Rahul Gandhi through the entire post Karnataka election result drama? Rahul Gandhi was missing. Yes, you read that right. The Congress President and the beloved hallowed Prince of Indian liberals was nowhere to be seen. He has been missing for a while now, since the results of the Karnataka Assembly were declared, to be precise. Rahul Gandhi has been hailed as the Congress’ Prime Ministerial candidate. He had even declared his wishes to be the PM of the country. He was being showered with praise and adulations during the whole campaigning process but now he has been missing. BS Yeddyurappa was sworn-in as the Chief Minister of Karnataka a couple of hours ago after a long night of drama and adventure that would put the choicest Indian daily soaps to shame and right now, Congress leaders along with their new found best friends JD(S) cadre are holding a dharna in front of the Vidhana Soudha in Bengaluru, but, Rahul Gandhi is not there. Rahul Gandhi was also nowhere to issue a statement or give his opinions when journalists and Congress’ lawyers were all over the residence of CJI Deepak Mishra late last night. In fact, the only traces of his existence since May 15th have been only a couple of tweets. Rahul Gandhi was not there when Congress held a press conference on the Karnataka verdict. He did not even acknowledge the public’s mandate that had brought the Congress from its previous tally of 122 seats to 78 seats. Rahul Gandhi was nowhere when Congress was cornered and in a move of absolute desperation, offered JD(S) the CM’s position on a platter. That is despite the fact that Congress had 78 seats and JDS a mere 37. It was not the Congress President Rahul, but his mother Sonia Gandhi, who had reached out to JD(S) supremo HD Devegowda. Interestingly, it was Congress leader Ghulam Nabi Azad who rushed from Delhi to save the day for the party, not the party President. 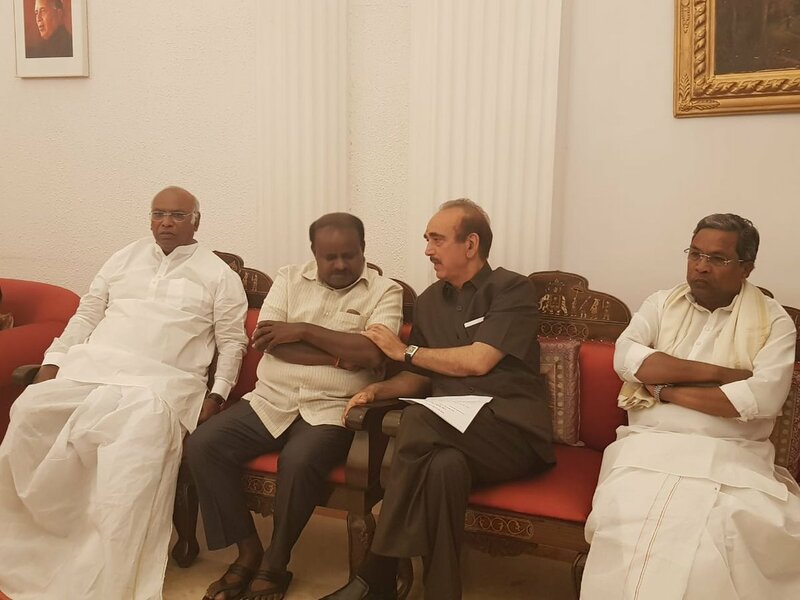 When the incumbent CM Siddaramaiah was busy in talks with HD Kumaraswamy and HD Devegowda, with whom he had had a fierce rivalry in the past and even agreed meekly to surrender his CM’s post to have JDS support Congress, Rahul Gandhi was still missing. Many people did notice Rahul’s absence in the events. Rahul Gandhi had been missing in all the high voltage political drama that has been unfolding in the last couple of days. Yesterday, the Congress had held another high profile press conference declaring that they will not accept the Governor’s decision to invite Yeddyurappa to form the government. Congress leaders like P Chidambaram, Kapil Sibal, Randeep Surjewala and several others were present, but, curiously, though the Press Conference was in Delhi, Rahul Gandhi was still Missing In Action. Rahul’s Gandhi name and image were flashing everywhere in the run up to elections, but after the declaration of results, his absence is staggering. Though the mainstream media is too docile to the Congress to ask uncomfortable questions regarding its prince charming, shouldn’t the leader of the party which held power in the country for almost half a century and the one who has hopes to become the PM one day, be a little more involved in important political negotiations? Or is Rahul Gandhi comfortable only to read from custom prepared speech notes and pose prettily for photo ops? Is Rahul’s conspicuous absence the result of his inability to make negotiations or is it just sheer indifference? Are the Congress leaders really looking up to Rahul as their leader? If yes, then why are they not demanding more involvement from him? Rahul has been known to vanish to undisclosed locations after crucial elections. Is it another of those clandestine trips abroad? If yes, it is definitely a shameful situation for Congress when their leader abandons them to scramble for themselves while they need him most.